Like an old fashioned atelier, Madame Hall is the kind of designer you’d find discreetly tucked away off the high street. One with a bustling workroom full of trims, buttons, pins, tape measures; all in constant use. Cardboard patterns hang on the wall among fashion sketches’, photos that inspire and notes about her clients orders…..Madame herself, is, of course always there, advising her 2 assistants and discussing the best approach to every garment; showing how she like a button sewn or looking for the best thread colour for a particular garment. And when words fail, she knows exactly how she wants something done, and sits down at the sewing machine to demonstrate! 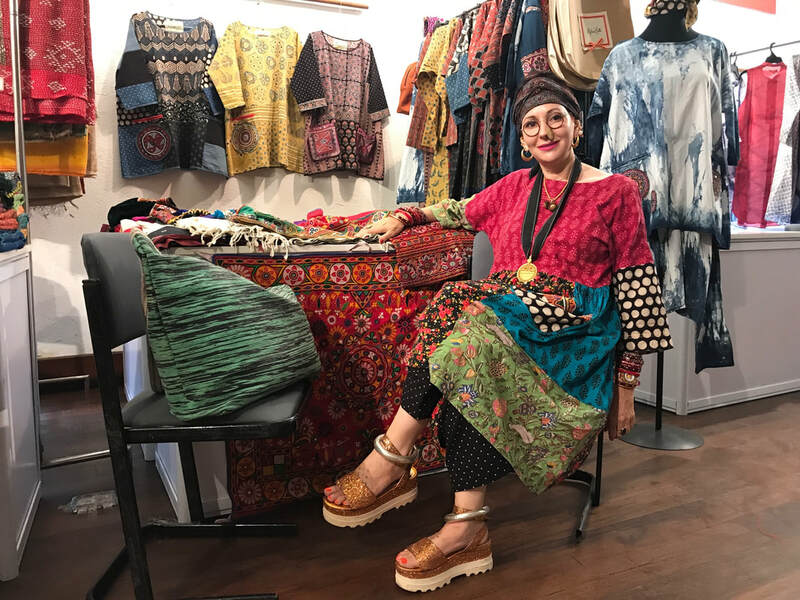 But this modern day atelier is not in Paris, New York or Melbourne….She’s Lisa Hall, an Australian designer who fell in love with the textiles and embroideries of Kutch in north west India. Unlike most western designers who travel to India, Lisa was not content to just return to home with arm loads of Indian fabrics to make up in her former home town of Sydney…. Passionate about creating and working with local artisans, over 5 years ago Lisa packed her bags, took her 3 Aussie cats and her sewing machine and moved to Bhuj, a small but bustling town in the centre of the Kutch district to begin a new life designing exclusively with Kutch hand crafts. This opens up a world of opportunity for you! You’ll find something new, different and exquisitely crafted by Madame Hall herself nearly everyday…you’ll never see another quite like it because all the materials used to create a ‘Madame Hall’ are unique and/or vintage and simply….unrepeatable. Madame Hall designs are one-of-a-kind! As the only foreign woman living in remote Bhuj, life for Lisa is interesting, exotic and full of unexpected quirks with never a dull moment… Follow her on Facebook and Instagram for her latest adventures.